When you are going into any new situation or journey, you always need to prepare. I have learned that you can’t know everything that is going to happen but you need to be equipped. In the adoption journey it is so difficult to prepare for behaviors that could possibly happen or never happen. So, instead of being overwhelmed with the “what if’s” it is much more comforting to have read some resources and know that you might have to go back to them when certain behaviors appear. 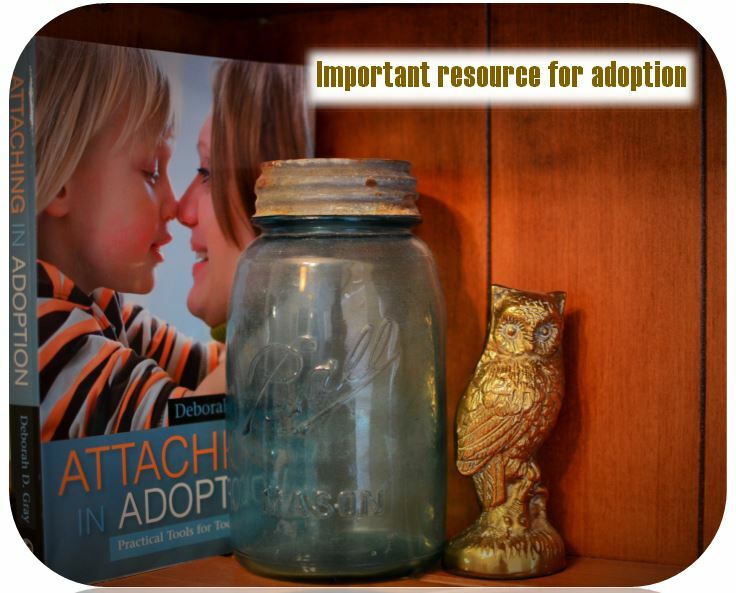 When you continue to read these adoption books, you get a good idea where to start. As we all know…..parenting takes a village of people. So, surround yourselves with books, pod casts, adoptive families, doctors, teachers, pastors, counselors, and people who are just encouraging no matter what happens~! *This is definitely a book you read more than once. The teacher in me always wants a method of remembering these great ideas. I usually start something and then change my mind….but here are two ideas you might try. *Stick it on with a tab hanging out of the book. On the tab write the behavior that is addressed. This is nice because you can quickly pick up the book and see what behaviors are addressed in the book. *In a notebook designate a few pages for each behavior you come across during your journey. This allows you to write notes from many different resources about one behavior. This makes it easy to look back and quickly see advice, doctors, symptoms, or even blogs with advice. This happens to me all the time! I remember when I was in high school, I would work all week on a project to make it perfect. I would get a A+, however the person next to me would do theirs last minute and would also get the A+. Oh!!!! This fustrates me !! So, like I said in my last post…..I am resting and listening to God….forgeting the details that I have planned! For example, I want to work so hard this summer and save lots of money for the adoption ……NOPE…(that’s a detail) – Let me explain something….I know that working in the summer and studying scripture is totally possible however, my personality is one that would work like crazy making no time for God…so I am not saying that working in the summer is bad…It’s just my summer to learn a lesson and rest. And I need no excuse!! There are so many things with adoption that you just natually want to plan or control. But that is not letting God shine…that is letting our plan shine. I’m so thankful for other blogs/friends that share how the journey is not easy but well worth it! I need to work so hard and fill myself with scripture so I am ready when God provides me with the resources and children! This sounds so easy and like….duh!! But let me tell you….this is Not easy. We all have areas in our life that need a little fine tuning, it’s just hard when you realize what yours is. But at the same time it is exciting to know that God is showing you areas of your life that you could gain more clarity and wisdom to become more understanding about His will for your life. That is pretty cool if you ask me.